This is my third and final costume for A Dollar Tree Halloween Series in collaboration with Dollar Tree. I had so much fun doing this and will have to continue this theme each year. The possibilities are endless and I had a hard time dialing down all the ideas to just three costumes. 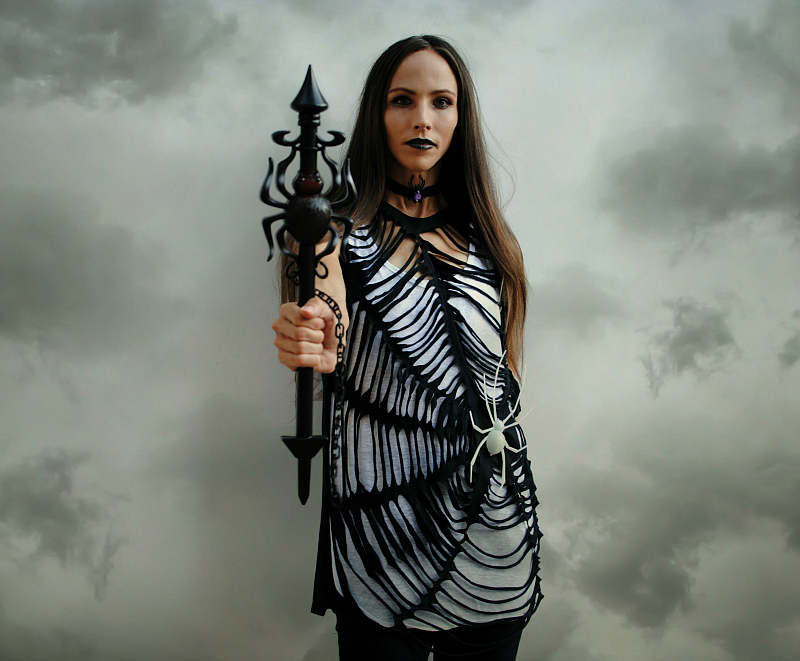 You can check out the previous ones: Skeleton Queen & Greek Goddess. As a mom of 3 boys, I spend most my October sewing getting their costumes ready (major cosplayers). This leaves little time for mine. Not only that but let's be real here, Halloween is about the kiddos and they definitely don't want me parading around in something that will "embarrass" them or a costume that is high maintenance. That's why I love this last minute costume and all you need is a t-shirt and a couple Halloween props from the Dollar Tree. The kids will love it and you can participate in all the Halloween festivities hassle free. 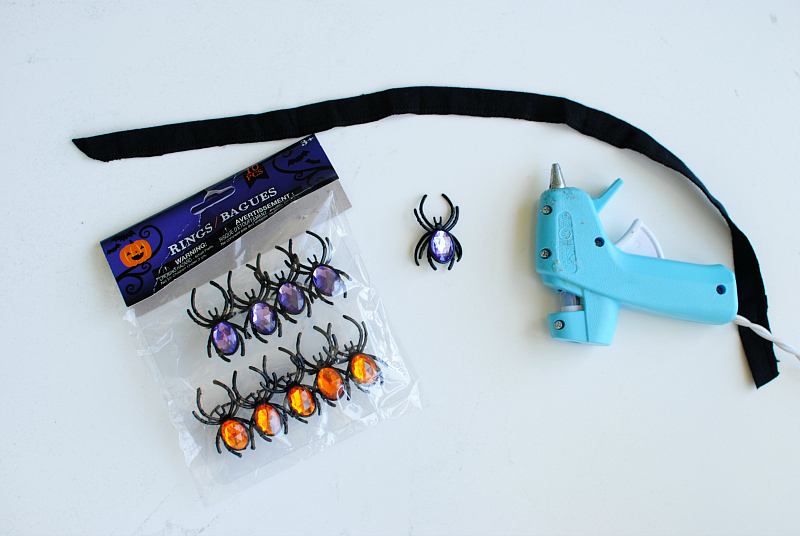 Get the details below on how to make your own Black Widow Costume. 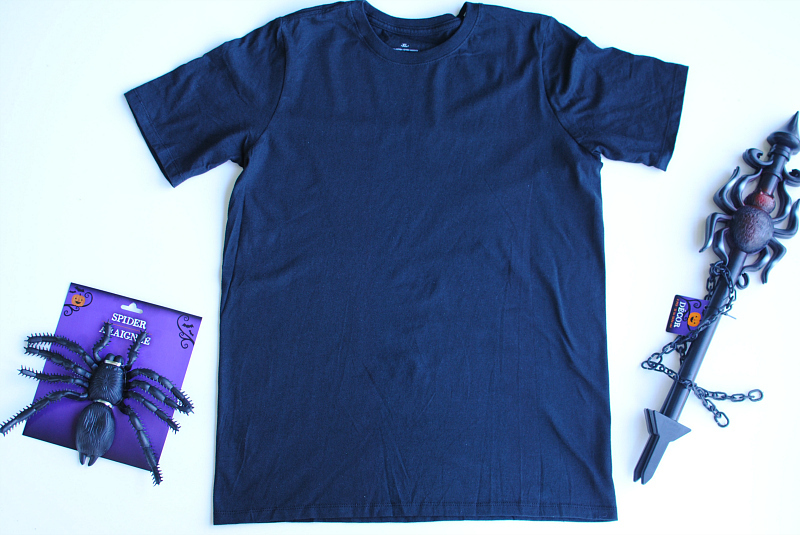 Begin by flipping your t-shirt inside out. Mark a circle in the middle/side of the shirt using a crayon or marking tool. From the circle use a ruler and mark lines going around the circle creating sections. I had no measurements in mind I just estimated how I wanted it to look. Fold the shirt in the sections so the lines meet together. They may not evenly match so just be mindful when cutting. Before cutting make sure you don't cut through the collar of the shirt, the back, the seams of the sleeve, and the lines between the sections. Cut finger tip width strips making sure not to cut through the lines (keep at least a 1" width in between the sections). If you're worried about cutting through then just cut the lines without folding so everything is laying flat and upright. I fold to keep the strips more even and it's faster. Continue folding each section and cutting strips. Tug each strip once done to create string. Don't tug too hard or you may tear it. Hot glue a spider on the circle. I used the bottom hem to create the choker by hot glueing a spider ring at midpoint and tied it around my neck. Now just add some black leggings/jeans and your good to go. That's it! Isn't this cool? It reminds me of the technique I used for my Black Widow Costume here as well. 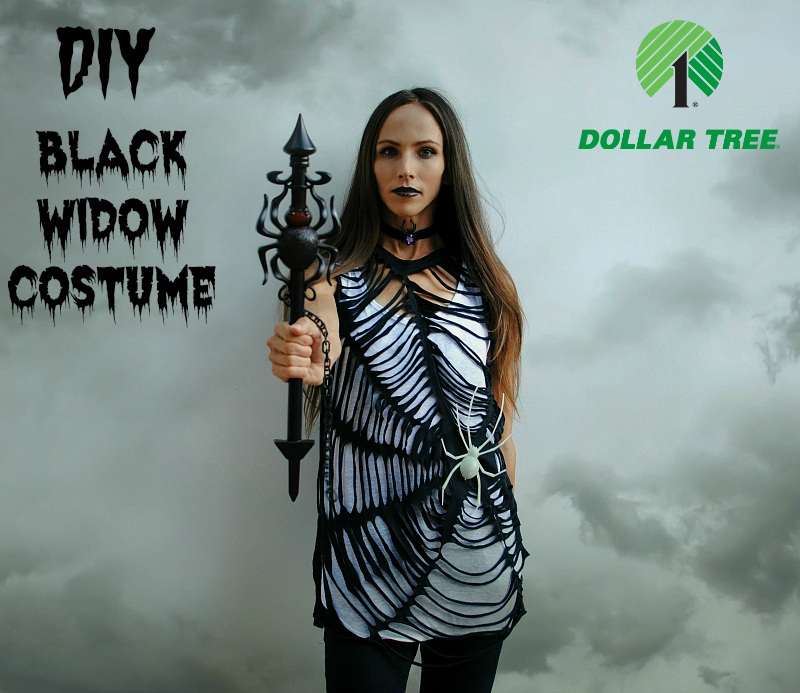 Try this DIY Halloween Costume yourself and make sure to tag #TrashtoCouture and #DollarTreeCrafts to be featured. *In collaboration with Dollar Tree. I love spiders and pick them up (not real ones) whenever I find them. Hallowe'en is a great time and there are new versions every year. 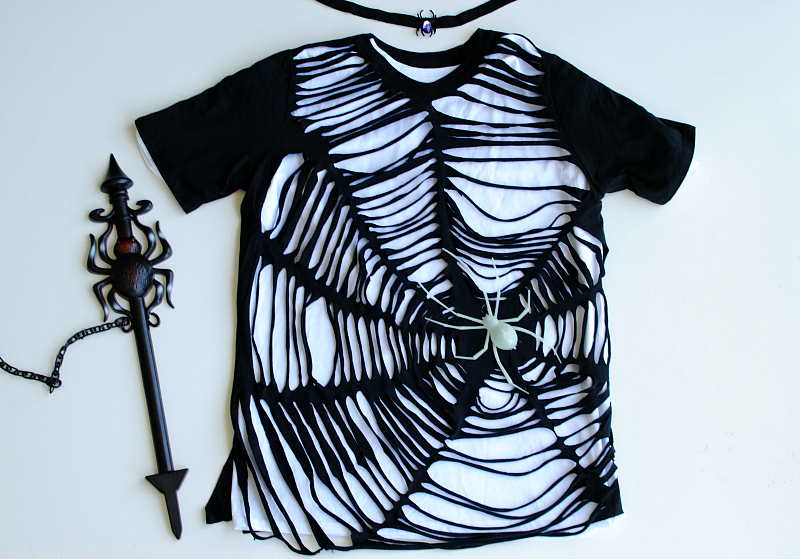 I got a couple black ones this year so I could make the web from a white T-shirt. Here in Canada it is usually cold on Hallowe'en so I will wear a black turtle neck. I was planning to use string to make a web on the front verandah but you helped me realize that I could use old white sheets to make a thicker, more visible web! I have a dream to write scary book in the future. I hope that this info about writing will help me with this question. The shirt is very unique, thank you for sharing the way.